Jobs on the line at LTM – can you help? Staff at LTM are fighting the loss of up to 9 posts at London Transport Museum – presented in an apology for a business case – quite frankly an insult to those at risk! 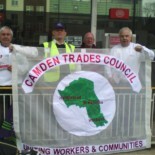 This entry was posted on March 25, 2013 by CAMDEN TRADES COUNCIL.